UKIP AM Gareth Bennett has been barred from speaking in Senedd debates in 2018 following a speech about transgender rights. Mr Bennett refused to apologise for saying society could implode if there was too much "deviation from the norm". Presiding Officer Elin Jones said on Wednesday some of the comments were "particularly hateful". Ms Jones wants the AM to say sorry before he can contribute again, but he said he had no intention of doing so. In a debate on Tuesday, Mr Bennett told the assembly: "There is only so much deviation from the norm that any society can take before that society completely implodes. "If we carry on down this road of appeasing the nuttiest elements of the transgender movement," he said, "then what we will face as a society, within a very short space of time, is total implosion." He was speaking about a UK government proposal to make the process of changing legal gender easier. 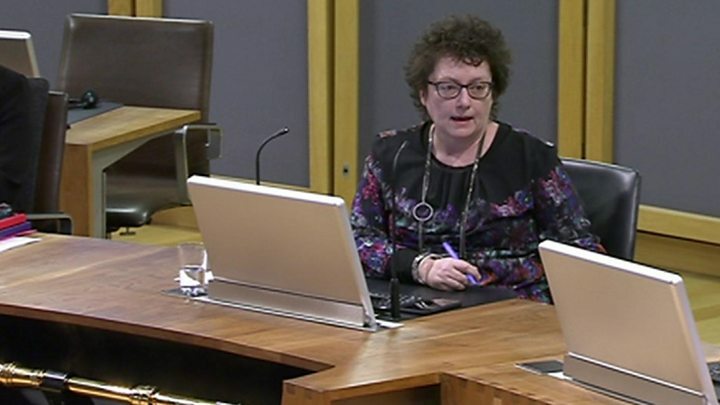 Media captionDecember 2017: Elin Jones said some of Gareth Bennett's remarks had been "particularly hateful"
After Labour AM Joyce Watson raised a point of order on Wednesday objecting to Mr Bennett's remarks, Ms Jones said: "Some of the comments were particularly hateful to the transgender community." 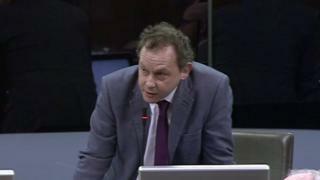 "This chamber is not a platform to demean citizens of Wales. Everyone deserves our respect and our understanding." The presiding officer asked Mr Bennett to withdraw his comments and apologise. He refused. UKIP Wales leader Neil Hamilton then intervened, saying it was a "point of argument and debate" and the remarks were related to a bill on gender recognition in the House of Commons. 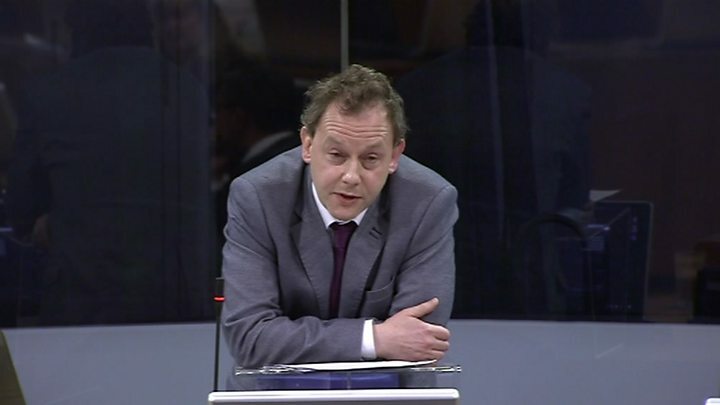 "If we cannot in this chamber debate the matters which are contained in a bill that is proposed to be introduced in the House of Commons, I think that's a very serious diminution of the democratic rights of the Welsh people," Mr Hamilton said. Ms Jones said the South Wales Central AM "will not be called in this chamber in 2018" until he apologises and withdraws his comment. Mr Bennett then left the chamber. Mr Hamilton attempted to make a further point of order, but Ms Jones dismissed the protest and went on to the next item. Ms Jones had singled out Mr Bennett's "deviation from the norm" comment for particular criticism. Speaking to BBC Wales later on Wednesday Mr Bennett stood his ground - saying he had no intention of apologising for the remarks. "I do not see that they are in anyway unparliamentarily," he said. "It would be a move towards a collapse of free speech if I was to apologise for them." Mr Bennett said UKIP AMs were unclear on which assembly rule was used to gag him: "As far as we were aware all that could happen is that I could be withdrawn or excluded from proceedings for one day." Among those critical of Mr Bennett was Plaid Cymru AM Sian Gwenllian, who said the comments were "shameful". "Members of minority groups have an unquestionable right to be treated equally, regardless of their gender identity, sexual orientation, colour of their skin, religion, disability or anything else", she said. Andrew White, director of LGBT rights group Stonewall Cymru, said: 'It is disappointing that UKIP's Gareth Bennett has singled out trans people as somehow less deserving of human rights than others." UKIP Wales leader Neil Hamilton said he had a "frank exchange of views with the presiding officer" on Wednesday afternoon, with a further meeting planned over the recess. "UKIP is a minority whose rights need to be protected as well," he added. "We were elected to confront the Cardiff Bay consensus and political correctness and will continue to do so."